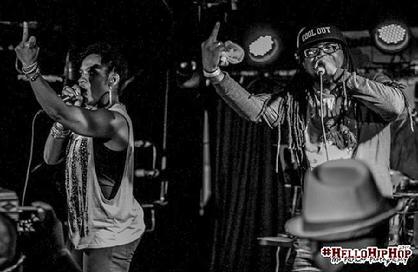 Urbanized Music is the Chicago based true school hip-hop performance duo of Amina and Coolout Chris whose mission is to entertain, educate, and inspire audiences through their music and advocacy of hip-hop as a vehicle for progressive change. Formed in the late 90’s Urbanized Music is a household name on the Chicago hip-hop circuit, they are considered one of the most exciting and energetic performance duos in the city. Their chemistry is unmatched and solidly reflects their longevity as they take audiences on a journey with music that not only connects to the listener’s intellect, but also rocks their bodies. Their style is reminiscent of the golden era of hip-hop fueled by intense lyricism and a contemporary take on the traditional boom-bap sound. In 2003, they founded Chicago Hip-Hip Initiative, a hip-hop community empowerment collaborative; and Chicago Hip-Hop Heritage Month, an official observance in July that celebrates Chicago hip-hop. In 2010 Urbanized Music was selected to serve as United States Cultural Envoys in the West African nation of Cote d’Ivoire where they spent 2 weeks touring 7 regions of the country. They performed, conducted workshops, held discussion forums, and helped foster an understanding of American culture while encouraging young people to use hip-hop peacefully. This experience was chronicled in the indie documentary "Keep It Moving-The Movie: Chicago Hip-Hop to Cote d’Ivoire". The film was edited & produced by Amina, scored by Coolout Chris and premiered to high acclaim in the 2011 Chicago International Movies & Music Festival (CIMMFest). Independently, Amina is a respected poet and educator, whose work is dedicated to promoting the aesthetics of hip-hop culture over media hype. Amina is an internationally recognized voice of grassroots hip-hop activism, and she has been on panels alongside Gloria Steinem, Fat Joe, Dr. Carol Adams, Billy Wimsatt, DMC, Bakari Kitwana, WaterFlow, Harry Allen, Jeff Chang, Joan Morgan, and many other activists, entertainers, and academics. She has taken part in Hip-Hop Theater Festival (MCA, Chicago), Taking It To The Streets (Chicago), Campus Progress National Student Conference (Washington, DC). Additionally, Coolout Chris is also a producer, dj, beatbox, and prominent figure in the Chicago hip-hop community. In the early 90’s he formed the rap group Spalaney’s who rose to local prominence touring with DJ Quik, and even performing for Prince at his Minneapolis nightclub Glam Slam. Coolout Chris is Executive Producer for Beat-Quarters Productions, and has had his music featured on radio, television, film, various websites, and podcasts. He has worked with many notable independent artists including Avery R. Young, Kevin Coval, Poetree ft. Fred Hampton Jr., Idris Goodwin, and many others. Internationally he has worked with Ezzdean, (Cote d’Ivoire/Nigeria), Centimett (Ghana/France), released two projects with Abidjan rapper Noble MC, and produced the Cote d’Ivoire Hip-Hop Initiative’s ‘Unity Album’ which was recorded by Ivorian artists while their country was embroiled in civil war. As a duo Urbanized Music has performed extensively and featured at many prominent venues like Steppenwolf Theater, Jay Pritzker Pavilion, Navy Pier Skyline Stage, Chicago Cultural Center, Double Door, The Vic, Joe’s, Metro, Elboroom, Cubby Bear, Subterranean and many others across Chicago. They have performed at a variety of festivals including the Uptown Unity Fest, African Festival of the Arts, Silver Room Annual Block Party, CIMMFest, Antioch College Hip-Hop Convergence, St Louis Underground Music Festival. Urbanized Music has also facilitated workshops and guest lectured at Depaul University, Northwestern University, Columbia College Chicago, Art Institute of Chicago, and the Boys & Girls Club of Chicago. Urbanized Music’s most recent album Remixed Live is a fusion of classic UM songs performed live and recorded in-studio. It features 15 tracks and is available on Google Play, Bandcamp, and SoundCloud. The duo is currently touring and creating new music.